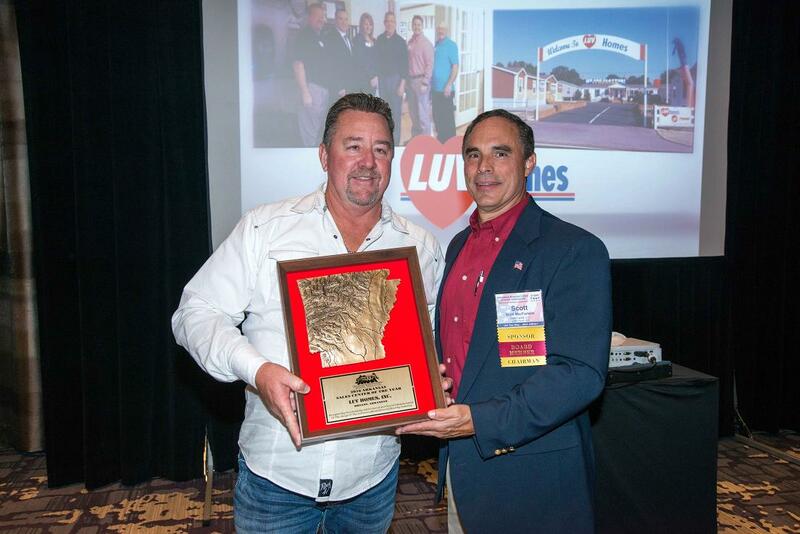 Little Rock, AR – LUV Homes of Bryant was named the Arkansas Manufactured Housing Association’s ‘2016 Sales Center of the Year’ during AMHA’s 45th Annual Meeting and Convention. The award was announced with a special audio/visual presentation during the organization’s Chairman’s Banquet – held October 27th at The Marriott Hotel in Little Rock. The retail home sales facility, located at 26244 Interstate 30 in Bryant, received the award in recognition of LUV Homes’ outstanding service to the industry and to the organization. Robby Edmonston, general manager of the location, accepted the award on behalf of the business and its staff. Owned by Clayton Homes, a division of Berkshire-Hathaway Corporation, LUV Homes has been recognized as one of the company’s best-performing retail locations in the nation. LUV Homes has exhibited an enduring commitment to excellence in customer service. The location has received ’Five-Star’ ratings for customer satisfaction after the sale for nine consecutive years. The staff at LUV Homes believes that this commitment is a key ingredient to the continued success of the business. LUV Homes and its personnel are active in the community, supporting charitable organizations and school programs in the Central Arkansas area. The business supports local youth sports programs; donates to outreach programs by law enforcement and fire departments; and actively supports efforts to assist battered women and families. Each year, AMHA recognizes the outstanding accomplishments and industry contributions of one retail sales center and its personnel with the prestigious award. Nominations come from AMHA members, and qualified entries are judged upon: overall appearance of the operation, business activity, professional and community involvement and service to the Association. Established in 1967, the Arkansas Manufactured Housing Association is dedicated to the protection and promotion of the state’s manufactured home industry through legislative representation, continuing industry education, public relations and communications efforts. AMHA members are businesses in all segments of the factory-built or site-delivered housing industry – including: manufacturers, retailers, community owners, suppliers, financial institutions, and developers. 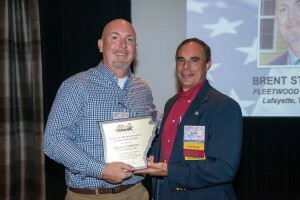 (From left) Robby Edmonston, general manager of LUV Homes of Bryant, accepts the Arkansas Manufactured Housing Association’s 2016 ‘Sales Center of the Year Award’ from Scott MacFarlane, chairman of the AMHA Board of Directors. The Arkansas Manufactured Housing Association (AMHA) recently recognized two member companies and one individual for outstanding contributions to the Association and the industry with the ‘2016 Industry Achievement Awards’. The awards were presented as part of the organization’s Chairman’s Banquet, October 27th during AMHA’s 45th Annual Meeting & Convention in Little Rock, Arkansas. Southern Homes of Russellville, Alabama – a division of Berkshire-Hathaway’s Clayton Homes subsidiary – was named AMHA’s 2016 ‘Manufacturer of the Year’. Founded in 1982, Southern Homes produces and markets quality housing at affordable prices to retailers and consumers in 15 states in the Southeast. The company employs more than 300 workers in its state-of-the-art 176,000 square-foot production facility, located on a 27 acre site off Highway 44 in Russellville. The company produces more than 2,000 new homes each year. Southern Homes consistently ranks as one of the leading producers of new HUD-Code manufactured homes shipped into the state of Arkansas each year. John Calvert, market development manager for the region, accepted the award on behalf of the company. (From left) John Calvert, market development manager for Southern Homes, accepts the Arkansas Manufactured Housing Association’s 2016 ‘Manufacturer of the Year Award’ from Scott MacFarlane, chairman of the AMHA Board of Directors. 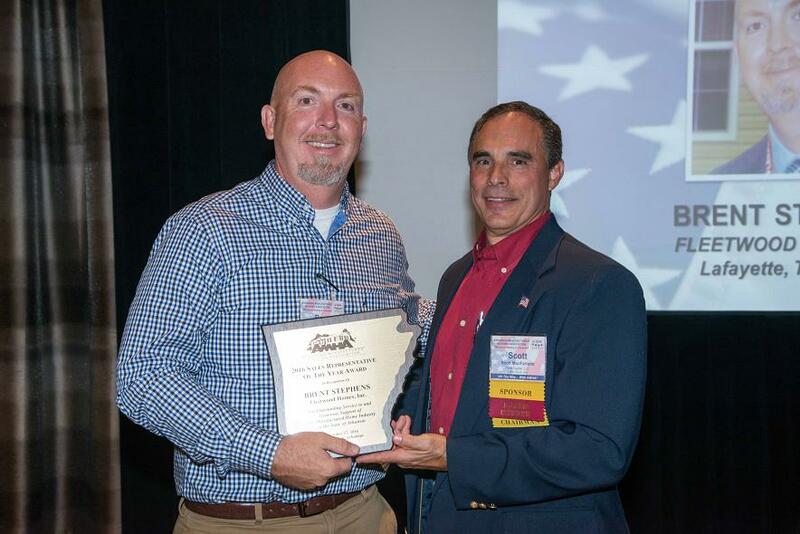 Brent Stephens of Fleetwood Homes in Lafayette, Tennessee was named AMHA’s 2016 ‘Factory Sales Representative of the Year’. Stephens joined Fleetwood in 1994 as a production line worker. He served as quality assurance manager and customer service manager before joining the sales force in 2011. Currently, Stephens services more than 25 retail accounts in Arkansas, Missouri and Tennessee. Stephens and his wife, Stefani, make their home in Gallatin, TN and are the proud parents of four children. 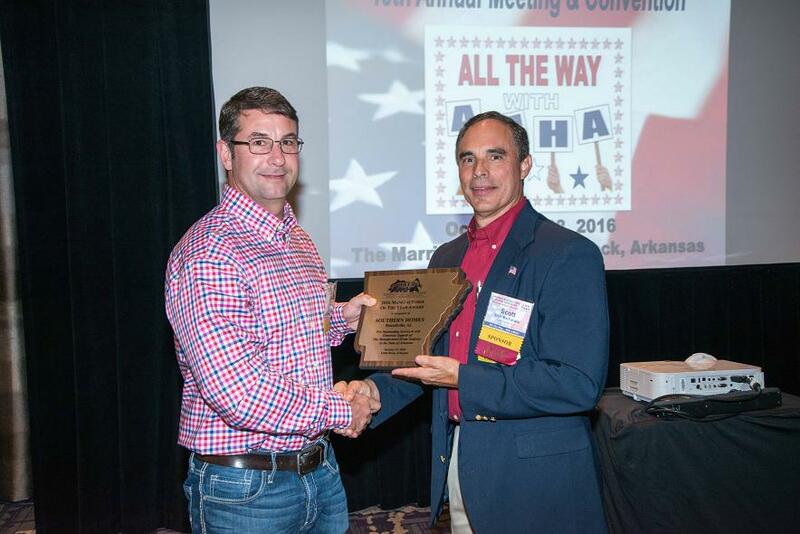 (From left) Brent Stephens of Fleetwood Homes accepts the Arkansas Manufactured Housing Association’s 2016 ‘Factory Sales Representative of the Year Award’ from AMHA chairman Scott MacFarlane. 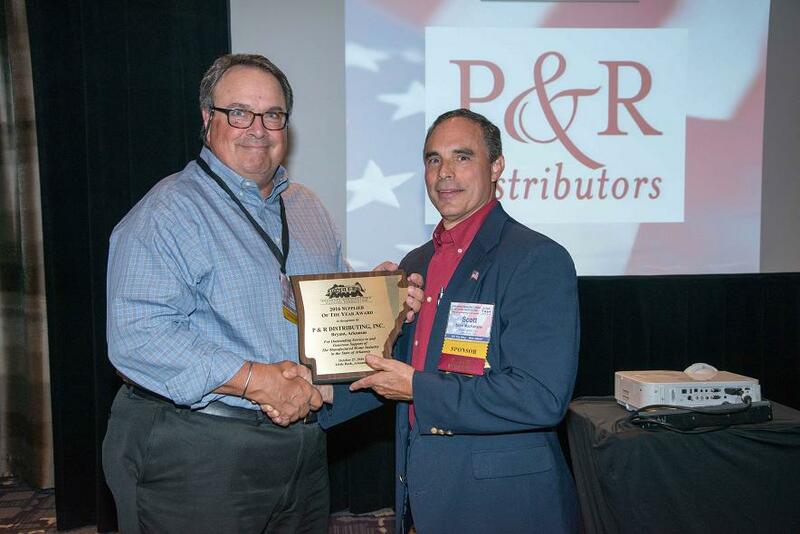 P&R Distributing in Bryant was named AMHA’s 2016 ‘Supplier of the Year’. P&R is an independently-owned business which distributes parts and supplies to factory-built housing businesses and the general public at-large. P&R Distributing offers heating and cooling products and service, doors, windows, plumbing supplies, appliances, skirting, tools, hardware and more. The company, located at 21914 Interstate 30, was founded in 1987. Cari Williford is the owner and company president, and Ted Friedman serves as manager and sales representative. (From left) Ted Friedman, sales manager P&R Distributing, Inc. of Bryant, accepts the Arkansas Manufactured Housing Association’s 2016 ‘Supplier of the Year Award’ from Scott MacFarlane, chairman of AMHA’s Board of Directors. AMHA’s Achievement Awards recognize the outstanding achievements of individuals and businesses involved in the state’s manufactured home industry. Honorees are chosen from nominees recommended by members of the organization. Established in 1967, the Arkansas Manufactured Housing Association is dedicated to the protection and promotion of the state’s manufactured home industry through legislative representation, industry and consumer education, public relations and communications efforts. AMHA members are businesses in all segments of the factory-built or site-delivered housing industry – including: manufacturers, retailers, community owners and developers, suppliers, financial institutions and other affiliated businesses.